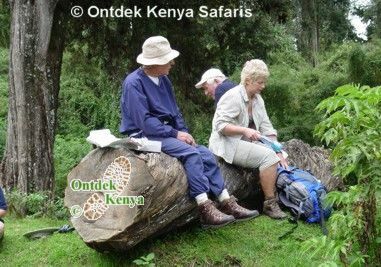 Ontdek Kenya Safaris organize Mount Kenya hiking safaris with pre-mountain guided game viewing walks in the Aberdare region away from mass tourism. We offer relaxed mountain programs that slow you down so that you easily acclimatize to high altitude. Why do we do this? It is because with +20 years of experience as the leader of active holidays in Kenya we want you to have a Mt. Kenya trek that is truly enjoyable. Go directly to the itinerary. Your Mount Kenya hiking tour starts at the Sangare Ranch for game viewing walks with easy to see giraffes, gazelles, and zebras. A game drive in the Solio Rhino Conservancy, which holds the highest concentration of Black Rhinos in Africa, is another highlight in your Mount Kenya hiking tour. This itinerary features the Sirimon - Naro Moru route for circumnavigation getting scenic and different views of Mount Kenya. But consider we can do Sirimon - Chogoria should you wish it so. The Mt. Kenya hiking has a day for acclimatization and as in all Ontdek Kenya safaris this tour is fully supported with accommodation in mountain huts. 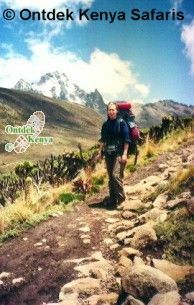 For tailor-made Mount Kenya hikes as well as extensions in Samburu please contact Ontdek Kenya Safaris. With renowned Ontdek’s ground logistics, accommodation in select lodges and tented camps, knowledgeable mount Kenya guides and options of small groups or private departures the time is right to book your Mt. Kenya hiking tour. Arrival and transfer to a Nairobi hotel. A 3 hrs transfer takes you to Nyeri in central Kenya, home of the Kikuyu tribe. You will drive through the main farming areas of Kenya with a lot of coffee and pineapple plantations. We will make a stop at the open air Karatina market, which is the biggest farm produce market in the region. We arrive at the Sangare Tented Camp in time for lunch. Sangare is a 6500 acres private wildlife conservancy sandwiched between the Aberdares and Mt. Kenya. The 12-tent camp overlooks a fresh water lake full of exciting bird life where game comes to drink. The Sangare Hill forms a magnificent backdrop for the camp. The ranch whose habitat is savannah with scattered bushes is home to zebras, giraffes, antelopes, warthogs, leopards, hyenas, elephants and buffaloes. Bird life in Sangare is rich with +300 Kenya bird species recorded. The tents are spacious and luxurious with four poster beds, unique African furnishing, private verandas and en suite facilities with flush toilets and shower. Your stay here will be for guided game viewing walks in the open plains where you will have sights of giraffes, zebras, gazelles, elands, Bush bucks and of course the numerous birds. After breakfast we drive to the nearby Solio Ranch for an extensive game drive in the Rhino sanctuary, which has the a large concentration of Black Rhinos. The White Rhino is also found here as well as the Reticulated Giraffe, Leopard, Lion and a wide range of plains game and bird life. Lunch is at the Naro Moru River Lodge, our base for our Mount Kenya hiking tour. Afternoon spent relaxing or walking around the garden and along the river trail looking out for colorful assortment of birds which are residents in this area such as African Green Pigeon, a range of Sunbirds e.g. the Tacazze, Bronze and Variable Sunbird, Rufous Chatterer, Chin-spot Batis, Giant Kingfisher, Mountain Wagtail, Turacos, White-headed Wood-Hoopoe, Golden-breasted Bunting, Northern Pied Babblers among others. O/N is in the Naro Moru River Lodge. At the lodge we connect with our mountain support team. A 2-hour drive takes us to the park gate (2600 m) from where we walk through the rain forest aiming to get to Old Moses Camp (3400m) in the early afternoon. Today's walk allows us to see birds that are only found on high altitude. From Old Moses Camp, which is just above the tree line, we get our first sightings on the peaks. Overnight is in the mountain hut of Old Moses Camp. Through the Mackinder’s Valley we walk to the Shipton’s Camp. This walk will take us 6 to 8 hours. For the first time we encounter the lobelias which will be covering most of the ground. All around us will be various streams and the area is at times quite boggy. Picnic is on a scenic spot along the way. Animals are still with us though just represented by the rock hyrax, its pint-size not withstanding, is the closest relative to the elephant. We should reach Shipton's Camp (4236 m) by early afternoon. Batian, Nelion and Lenana, the three majestic peaks of Mt. Kenya will be clearly visible from here. This is a point from where great panoramic photos can be taken. Dinner and overnight in the mountain hut of Shipton’s Camp. Day 7. Acclimatization day on the Mount Kenya hiking safari. Walks in preparation for the climbing of Point Lenana. Dinner and overnight are at Shipton’s Hut. We then set off, after a light breakfast, for the ultimate of our trip: Point Lenana, which we hope to reach with sunrise. The view from here is truly rewarding as the whole of the area, including the complete Aberdare range can be over viewed. After a short rest we start the descending along the Lewis glacier to reach Mackinder’s Camp (4200 m) for a hearty brunch. In the afternoon we descend further to Met Station (3050m), which is below the tree line, for overnight. Walk to the park gate from where vehicles await us for the transfer to the Naro Moru River Lodge for lunch and overnight. The morning is spent at leisure. Time to reflect the mountain trekking. After lunch transfer to Nairobi for the evening flight. Itinerary changes may be made due to local conditions beyond our control. PRICE: Our attractive price based on the size of your party includes all accommodation as per itinerary, all meals from breakfast of day 2 through lunch of day 10, all transport Nairobi-Nairobi and airport transfers, bottled water during the walks (except for on Mt. Kenya), services of guides and porters, the park entrance fees and a Flying Doctors Evacuation cover. The only extras on you are spendings on airfare to Kenya, airport taxes, visa, insurance, drinks at the table, tips and expenditure of personal nature. To plan your Mt.Kenya climbing expedition, contact Ontdek Kenya Safaris. Benefit from our 20+ years of experience in organizing Mt. Kenya trekkings.